Another Bill W review for you! This is Bill's first flight review for Rewards Canada. You can find many of his hotel and lounge reviews right here on the blog. Bill is a true road warrior, his work has him driving and flying across Western and Central Canada every week while staying in a variety hotels from a variety of chains. 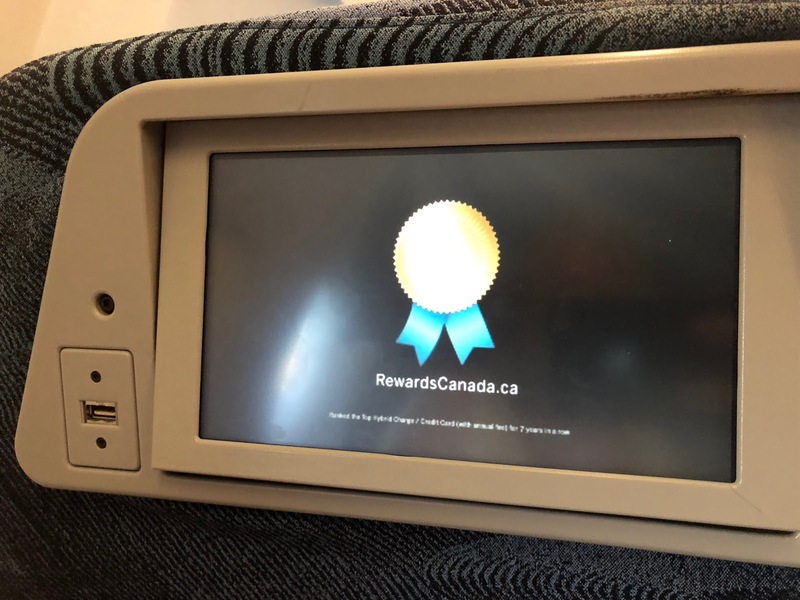 Bill has been reading, following and providing Rewards Canada tips and updates for a very long time so let's welcome him back with this contribution! The check-in experience was very good. As we were flying Premium Rouge, we were able to utilize the Air Canada Priority Check-in. The agents were very pleasant and were able to process us through very quickly. They also mentioned that with my status (Altitude Elite 50), we would be able to access the Plaza lounge once through security. 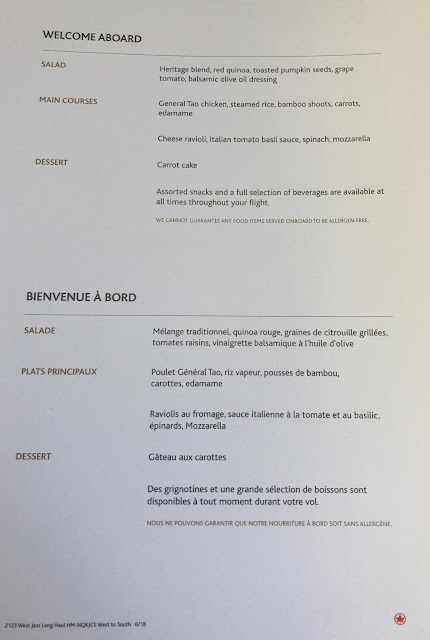 (The Maple Leaf lounge is only available for domestic flights, not trans-border or international). Clearing U.S. Immigration was also a breeze thanks to our use of the NEXUS card. No line at the kiosks (compared to about 20-25 persons in the regular line). A couple of questions, fingerprint scan and pictures was all it took and we were through in less than 5 minutes. The lounge itself was not too crowded, but over 80% of the tables had not been cleared of dishes/glasses from previous guests. The food selection was good, several hot dishes were available. They had a good selection of beverages, all self-serve. (The ice was actually not in a very prominent place, finally found it in a bucket in the cooler in the counter). The washrooms were very clean and well-stocked with toiletries. The tables were finally cleared after we had been there about 30 minutes, not sure if there was a staffing issue. Our flight out was the last one of the evening, so they gave us advance notice about last call, which was appreciated. The plane was on time and we had a very short wait at the gate before boarding. The Premium Rouge section was actually full, though it had shown only 4 persons booked several hours before flight time. (I had checked before boarding, the standby for upgrade list was full). Nonetheless, there was no problem getting in and getting settled (Zone 1 boarding is nice….). The flight attendants were very attentive, making sure we had water, headsets and our complimentary iPads for entertainment before take-off. It had been awhile since I had flown Rouge and it was nice to see that they had upgraded the Premium Rouge seats to a proper 2-2 configuration instead of the blocked middle seat that was previously used. The improved seat width (21”) and pitch (36”) was very much appreciated. The service by the flight attendants was very good throughout the flight. 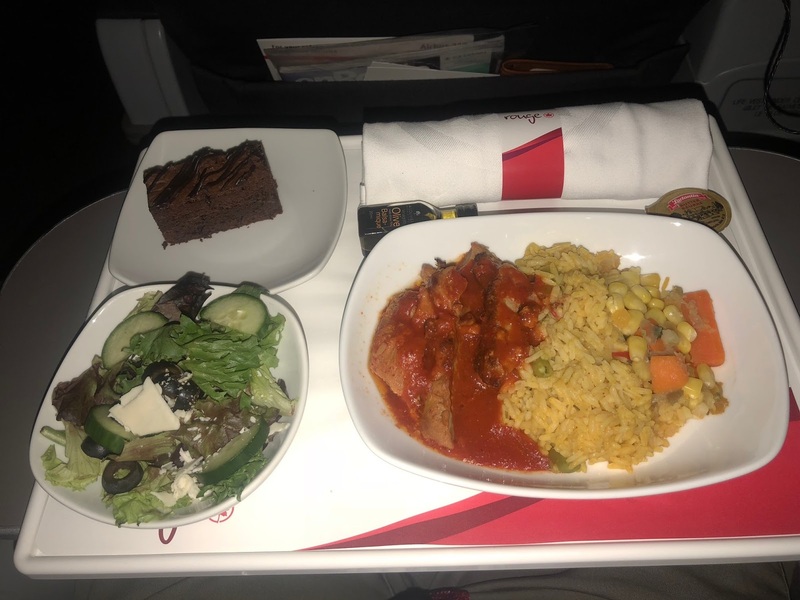 We were offered our first round of drinks shortly after the seatbelt sign was removed and our meal followed within the first hour of flight time. We had a tossed salad and main course of chicken with a nice sauce along with rice and vegetable. Buns were made available and there was also a chocolate brownie for dessert. The meal was nice and hot and well presented. Again the flight attendants were very attentive and came and removed the dishes as soon as we were finished. There was a good selection of movies preloaded on the iPad, with enough variety in genre to satisfy most everyone. On the Rouge aircraft (at least in Premium Rouge), there is a flap on the seat in front of you that you can put the cover of the iPad in so that it mimics having a seatback screen. This makes it easier as you don’t have to have the iPad on your lap or the tray (especially significant if you are watching your movie while eating). It is important that you check the running time of your movie selection to ensure you have enough time to watch it in its entirety; otherwise you may have to finish it on the return flight. The iPads are collected 10-15 minutes before landing in order for the flight attendants to prepare the cabin for arrival. Of course, if you are using your own device, this is not much of a concern. The flight itself was uneventful, was very smooth with no turbulence. The pilots did a great job with the landing and we were just slightly ahead of schedule. Deplaning was no problem with the Flight Attendants thanking everyone as we left. All in all was a very pleasant flight and a good way to start our Vegas Vacation. At the airport the check-in procedure was again very easy. Because of the delay, each of us received a $15USD voucher to be used for food. The agent was very pleasant and helpful and made sure we knew where to access the security line. He also reiterated that we had TSA precheck. This is also a nice perk to have as it saved about 15-20 minutes versus the regular security line. (TSA Pre✓™ Experience: Being referred to a dedicated lane, Quicker transit through airport security screening, Faster moving lines, Improved travel experience. No Removal of: Belt, Shoes, Light outerwear/jacket, 3-1-1 compliant liquid bag). With an extra 2 hours to kill, we did a bit of shopping and then went to the United Club lounge (again, a benefit with status and flying J). This lounge was very quiet and quite empty. They do offer some food, but mainly just snack items, cheese, crackers, veges. There is also a full bar with a bartender to serve drinks. If you stay with the well drinks, they are complimentary, but anything else above that is charged for. (For example, the well white wine was a Pinot, but if you wanted a Sauvignon Blanc, the cost was $12.00USD). And of course, a tip for the bartender. Our (new) flight was on time. This was a mainline Air Canada A320 instead of the Rouge A319. Very similar in configuration, but without the Rouge “touch”. Again, the Business Class cabin was full, and it appeared that the entire flight was fully booked. Possibly this flight had passengers from another flight as the seating chart for the original Rouge flight had only shown about 60% capacity. The flight attendants again were very attentive and addressed us by name when enquiring about our dinner choice. We had another chicken dish (the other option was a spinach lasagne) with rice and vegetables and slice of cake for dessert. 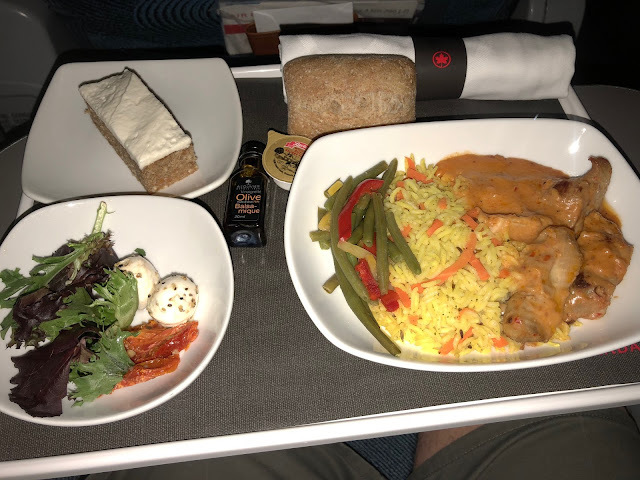 The beverage service was good, though a Gin & Tonic was not available as there appeared to have been a problem with the cans of Tonic and Air Canada has temporarily removed them from their aircraft, apparently they were “exploding”. (This issue has since been resolved). We were able to catch the end of the movie from the previous flight and watch another during the trip home. Apart from the cancelled flight, the return trip home was fine, the flight was good and on time. As we neared Canada, the Flight Attendants started to hand out the Customs declaration cards to be completed prior to landing (Note: if you are traveling outside Canada and know you will need to fill out the card, bring a pen. The flight attendants don’t have enough pens for a plane full of 146 Travellers. They will certainly appreciate it and you can be confident that you can get the card filled out before landing). However, they were also asking passengers if they were NEXUS members because it is not necessary for a card to be completed if you hold NEXUS membership. Seated at the front of the plane obviously means you will be first in line at Customs and be able to beat the rush. Again, this is where the NEXUS membership is very useful. YYC (and most major airports) have dedicated NEXUS lines for passengers leaving Canada and returning. These lanes are way shorter than for those who do not have a low-risk traveller designation. (As a side note, we once returned from a U.S. flight at the same time as 2 or 3 other flights from out-of-country. Everyone must clear Customs and that meant that there were probably over 400 people all trying to go through at the same time. That does create a lot of long lines and perhaps frustrations as not everyone may have completed their declaration forms correctly.) Compare that to the NEXUS line where we had to do an Iris Scan and/or fingerprint check and answer a couple of questions and were through in less than 5 minutes. (I highly recommend that anyone who travels even only once a year should obtain a NEXUS card. Not only does it identify you as a low-risk traveller with expedited Customs clearance, it also allows you priority screening at the security lines, even on domestic flights). Overall both flights were very comfortable and the Flight Attendants very attentive. And hey, the plane was going to Vegas so everyone was in a good mood.